Schroders published a further update to the Dashboard this week which highlighted the important role that carbon prices are playing in the global push to limit global warming. Specifically, despite the fact that the path of global warming remains virtually unmoved over the past 15 months, Schroders’ Head of Sustainable Research, Andrew Howard, believes that rising carbon prices in both Europe and the United States provides a bright spark, representing strong signals for change. This is especially the case in Europe where carbon prices have risen to their highest level for almost a decade, from €8 per tonne (t) a year ago to €24/t by the end of September 2018. In fact, Europe’s carbon price credits have grown from €15/t to over €20/t since the middle of 2018 and reached over €25/t in mid-September — a level not seen since 2009. The nearly year-long increase stems from Europe’s transition to its European Trading Scheme (ETS), however, Schroders believes there is a long way to go, and that carbon credits must reach as high as $100/t if we are to meet long-term emissions reduction targets. “There remains much further to go – we estimate prices will need to rise as far as $100 per tonne to meet long-term emissions reduction targets – and carbon pricing represents one piece in the puzzle of climate action,” Howard added. However, the bright spark of strong carbon prices is just that, a bright spark amidst a much larger shadow, bolstered by an increase in investment in the oil and gas industries, which leads Schroders to predict that we are still on track for a 4°C rise in global warming. 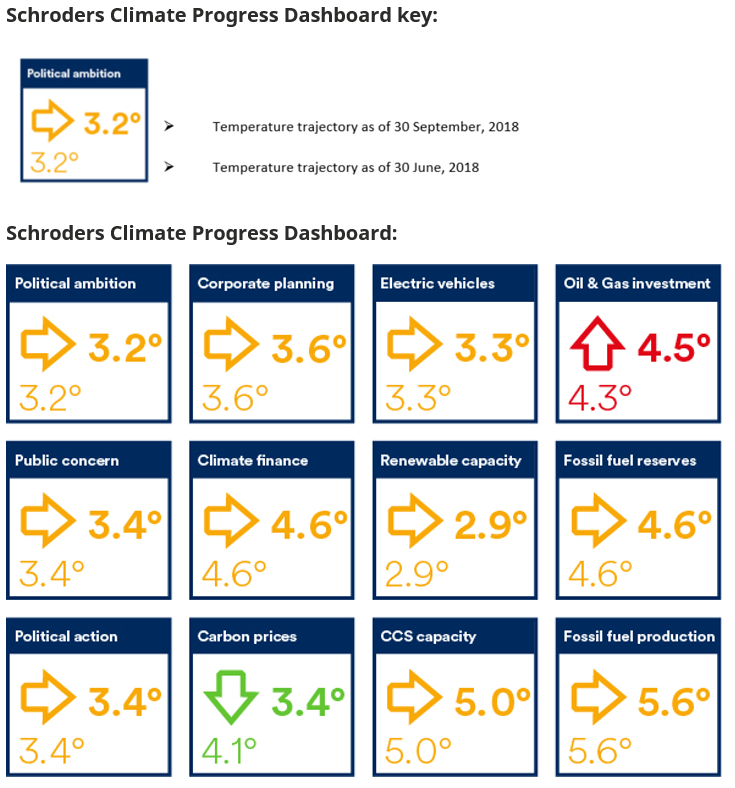 Schroders’ Dashboard is based on 12 indicators (below) which span politics, business, technological progress, and energy, identified as key drivers and controls of climate change. Together, they still point to a 4°C rise in global warming. Global crop yields would fall 30-40% below current levels on average. Up to 300 million people would be affected by coastal flooding. One-third of the world’s population would face water shortages. Global economic losses could build to $23 trillion over the next 80 years; equal to permanent damage three or four times the scale of the 2008 Global Financial Crisis, and continuing to escalate.